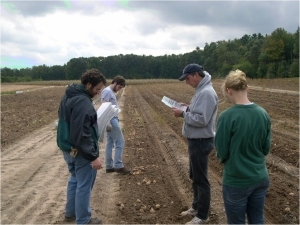 The goal of the Michigan State University Potato Breeding and Genetics Program is to develop, through a combination of conventional and biotechnological approaches, potato cultivars with the requisite agronomic traits for a target market class; resistance to diseases, insects, and abiotic stresses; and enhanced nutritional qualities. Here we present a time line of conventional breeding activities. 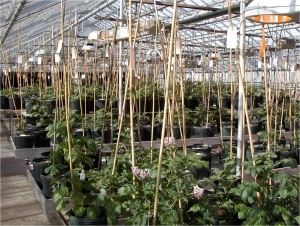 Greenhouse crosses and population development. During the first year, between 600 and 800 crosses are made (Figs. 1 and 2). Once the true potato seed is harvested, potato family populations are developed by planting the seed and growing mini-tubers (Fig. 3). Figure 1. Greenhouse facility at Michigan State University where potato crosses are made. Photo credit: Michigan State University Potato Breeding and Genetics Program. Figure 2. 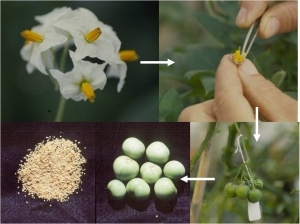 The progression of potato seed development from cross to seed. Photo credit: Michigan State University Potato Breeding and Genetics Program. Figure 3. Potato family mini-tuber production. Photo credit: Michigan State University Potato Breeding and Genetics Program. The potato family mini-tubers which were harvested in the fall of the first year are planted in the field. 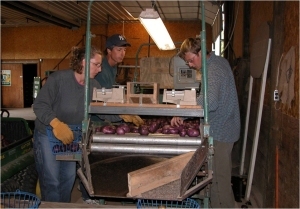 Each year the MSU Potato Program plants 50,000 mini-tubers. In the fall, after the growing season, single hill selections are made on phenotypic characteristics—appearance, yield, and maturity (Fig. 4). Usually, about 2,000 single hill selections are made every year. Figure 4. Single hill selections are made in year 2. Photo credit: Michigan State University Potato Breeding and Genetics Program. The single hill selections made in year 2 are planted in the field as 12-hill plots (Fig. 5). At the end of the growing season, the 12 hills are evaluated phenotypically in the field and the selections (usually about 500) are harvested. These tubers then go through early-generation disease and insect resistance testing as well as DNA marker and chip quality analysis (Fig. 6). Figure 5. The 12-hill potato plots are monitored throughout the growing season. Photo credit: Michigan State University Potato Breeding and Genetics Program. Figure 6. Selections made from 12-hill plots are sampled for disease testing and chipping analysis. Photo credit: Michigan State University Potato Breeding and Genetics Program. In year 4, the selections made in year 3 are planted in a 30-hill trial and go through another year of phenotypic evaluations, selections, disease testing, and chipping quality testing. Usually 200 selections make it through year 4. The process continues in year 5 with 50-hill plots concurrent with replicated agronomic trials. By the end of year 5, around 25 selections are recognized as advanced breeding lines. These lines are transferred to our tissue culture laboratory where virus and disease free plantlets are grown on nutritional media in test tubes (Fig. 7). Figure 7. Selected potato varieties are grown in our Tissue Culture facility at MSU. 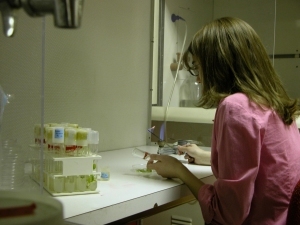 Potato plantlets grow in a sterile test tubes with nutritional media. These plantlets can then be used to grow certified seed tubers in the greenhouse or field. Photo credit: Michigan State University Potato Breeding and Genetics Program. During these years advanced agronomic trials are conducted, including on-farm grower testing and regional testing. Quality evaluations (Fig. 8) and disease and insect resistance testing continues. Chip quality testing continues and storage testing is conducted. Figure 8. Potato selections go through extensive agronomic testing. Here scientists are evaluating quality, size, and density of the MSU potato variety called Michigan Purple. Photo credit: Michigan State University Potato Breeding and Genetics Program. Throughout years 8–12, large scale agronomic and storage testing (Fig. 9) is conducted. Variety Release and Plant Variety Protection is considered. Certified potato seed tuber production is initiated. Contracts with seed growers are prepared. Figure 9. 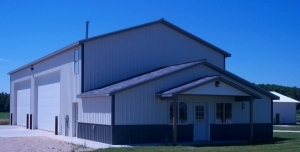 The C. E. Burt Cargill Demonstration Storage Facilty is located at the MSU Montcalm Research Facility. 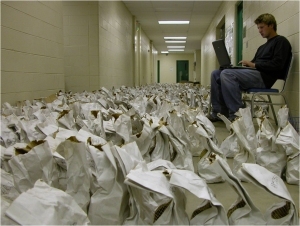 It is a state-of-the-art facility to test potato storage conditions. Photo credit: Michigan State University Potato Breeding and Genetics Program. For more information on the Michigan State University Potato Breeding and Genetics Program, visit our website at http://potatobg.css.msu.edu/.